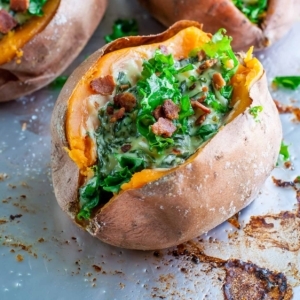 Creamed Kale gives this simple baked potato a luxurious make over! Havarti is a mild and creamy cheese that is sure to please kids and adults alike. 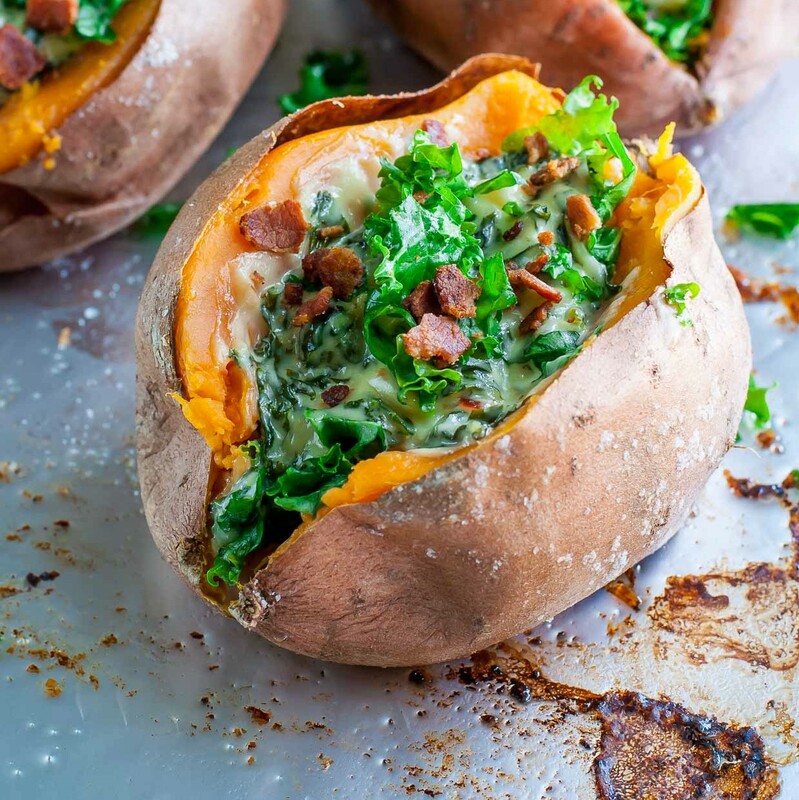 With the holidays around the corner, this recipe for kale can top off your leftover mashed potatoes, roasted squash or anything that could use a little pizzazz. For a veggie alternative to bacon: Toss 1 cup of your favorite nuts with 1 tsp smoked chili pepper, 1tbls brown sugar, salt and pepper. Bake at 350 degrees for 5-10 min until golden brown and fragrant. Pierce your potatoes a few times with a fork and place on a foil lined baking sheet. For extra crispy skins, rub with olive oil and sprinkle with sea salt. Bake 45-60 minutes until tender. Once your potatoes are done baking, allow to cool slightly and slice vertically. For the creamed kale remove the middle stem from each leaf and wash thoroughly. Chop into fine pieces. For bright green and super tender kale, blanch it before creaming. Bring a small pot of water to a boil and add your kale until bright green and tender, approx. 5-10 minutes. Rince with cold water in a colander and set aside. Return the same pot to your burner over medium-high heat with a drizzle of oil or butter. Add your garlic and onions and sauté on medium until browned around the edges, approx. 10 min. Add cream and the kale and keep heat at a simmer. Season with nutmeg, chili flakes, salt and pepper, to taste. Cook until cream begins to reduce and thicken. Stir in your cheese. Garnish with crumbled bacon or spicy nuts.